"Bestselling author Lutz (the Spellman Files series) hits a home run in this glorious exploration of friendship, which follows the trajectory of three college friends over 20 years. First there’s Kate Smirnoff (yes, “like the vodka,” she proclaims) raised by her grandfather after her parents’ accidental death when she was eight, destined to own her family’s business, a diner in Santa Cruz. There’s Anna Fury, an independent woman (yet needy for love) who eschews her upper-class background and has a penchant for adventure that almost upends her life. And then there’s George (Georgiana) Leoni, a gorgeous outdoorsy type with an uncanny perception about what makes people tick, yet who keeps falling for the wrong man. A traumatic event in their 20s binds the three women, and Lutz, moving back and forth in time, brilliantly intertwines their lives over the next two decades, as Kate leaves her sheltered life and explores the world, Anna pursues an M.D., and George becomes a forest ranger. The author portrays three fully drawn, flawed, and compelling women with fresh insight into the mysterious terrain of female friendships—a mix of shared experiences, affection, empathy, jealousy, anger, and love." 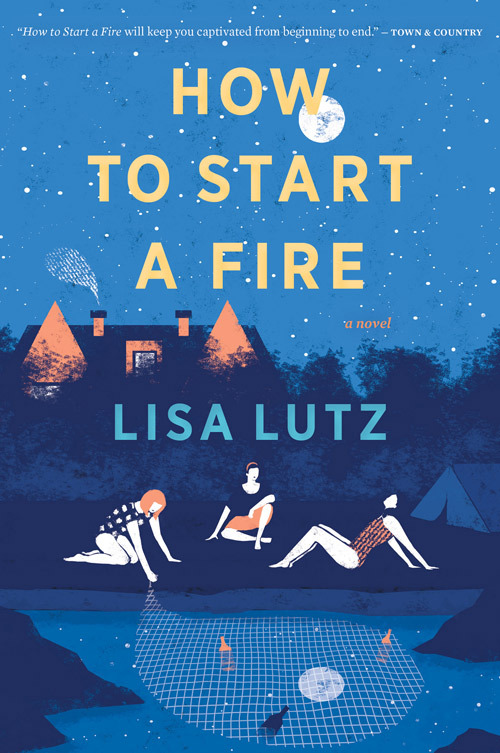 "An engaging portrait of female friendship . . .with wit and a gift for capturing the repartee between siblings and old friends, Lutz brings us a memorable and ultimately uplifting saga of three strong, unique women." "Few books have so expertly captured the intricacies and complexities of female friendship. Whipsmart and cunning, deeply funny and profoundly moving, Lisa Lutz’s How to Start A Fire is a knockout." "Telling the story of three women and their two-decade friendship, Lutz ventures away from her snarky Spellman Files series and ends up firmly in women's-fiction territory. Outrageous Anna, contemplative Kate, and sporty Georgina (George) meet in college when roommates Anna and Kate come upon a very drunk George passed out on a frat-house lawn. The dissimilar women quickly become friends, and the book unfolds as a series of flashbacks from 1993 to 2014. . . . The characters are marvelous—each woman, despite having some over-the-top peculiarities about her, is relatable and fully dimensional. Lutz’s offbeat wit is also on display, such as in one character’s reliable getting-to-know-you question of, “Who would you save in a fire, Keith Richards or Pete Townshend? The answer is Pete Townshend. A fire wouldn’t kill Keith Richards.” . . . An absorbing tale that will satisfy Spellman fans as well as women's fiction readers who like a good ensemble story." "Anna and Kate were randomly matched as roommates by their college, then they found Georgianna passed out on a neighbor's front lawn on the way home from a party. When George woke up the next morning, these three completely different personalities began a friendship that would last for decades to come. Die-hard fans of Lutz may be expecting something other than the story found here, but there's little chance of disappointment. Delivered in short chapters that move between the present and the past, the book shows readers results before actions, building a sense of intrigue up to the singular event that changed everything. The main characters are developed through vignettes in various stages of their lives, showing that they are as realistically flawed as they are emotionally engaging. VERDICT Any reader who enjoys a strong character study or the opportunity to discuss how small choices can have lasting impact will absorb every bit of this book with genuine gratification.